Sometimes, if we are very lucky, we create an object that is so perfect, so me that it can hardly be described with words, but must be felt to be understood. One of the first objects that I can remember knitting as a child was a Fair Isle poncho. 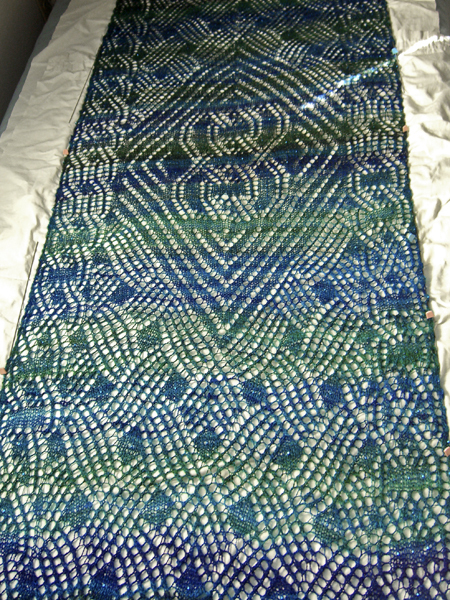 The main body of the poncho was knit from an acrylic faux mohair in a sort of tweedy golden brown. Around the border were white snowflakes. I was incredibly proud of it. I picked the pattern, even though the LYS owner said it would be too hard for me. And I knit the whole thing, even the snowflakes, even though I had to learn stranded knitting and I was still a thrower instead of a picker, even though it was hard and slow. I knit it. And I loved that poncho way beyond its actual worth as a knitted object. I wore that poncho constantly, even when ponchos were out of style. I wore it until it fell apart and had to be retired. When someone asks me what my favorite project ever is, I immediately think of that poncho. It was waaaaaaaay better than the first sweater that I knit, which I wore once… because mama forced me to. Yeah. That was the sweater that first taught me that cheating at gauge is a lose-lose proposition. But I’m not here to talk about ponchos and sweaters, beloved – or not – as they may be. I’m here to tell you about a little project that started way before I became involved in it. 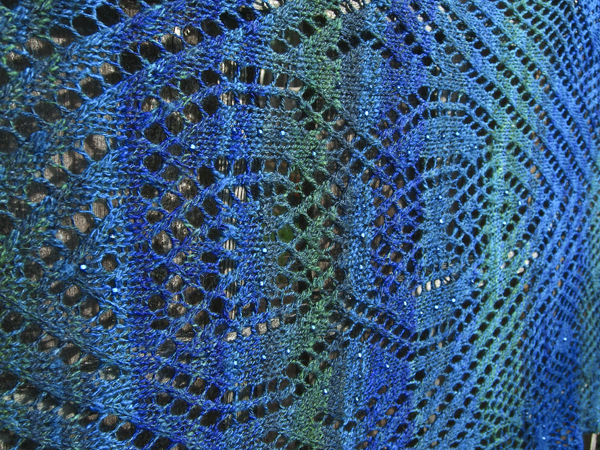 It started over a year ago at Oregon Flock and Fiber Festival in 2008, when Duffy purchased some gorgeous silk/merino fiber from Dicentra Designs in a colorway called Eowyn. Oh, yeah, that’s pretty, I said, in a sort of I-like-it-but-I’m-not-a-spinner-so-meh way. Pretty colors. Eventually Duffy began spinning it. Oh! That’s really pretty! I said, in a sort of I-like-it-and-it’s-turning-into-yarn way. Pretty colors. 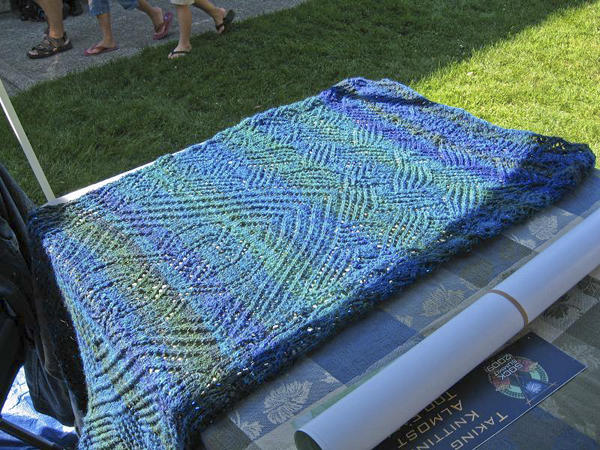 And this past summer, during knit in public day, Duffy spun while sitting in the sunshine, and the colors glowed on her bobbin – greens and blues and purples. oooooo! Pretty! Really, really pretty! I said, in a definitely I-really-love-that way. Pretty! Ooooooo! So my colors! And I bought some yarn and knit some socks, and was mostly content. But in the back of my mind, I knew I wanted to find some yarn that had just those colors in it. Because they are soooo my colors. And one evening at Wednesday Night Knitting, Duffy handed me a gorgeous skein of two-ply yarn with a tag on it that said Magic Judy. And I thought how sweet it was that Duffy had named it after me, and how pretty – how very, very pretty – the yarn was. And I started to hand it back. But Duffy said, I made it for you. It’s yours. And perhaps because I refused to let go of it no matter how I argued with her, she was adamant that it was my yarn and I needed to knit something with it. And so I began searching for a pattern. I decided the yarn wanted to be a wrap or shawl or stole. The colors are bright and strong, with long runs. So I wanted a pattern that had a strongly geometric component that would complement the color rather than compete with it. And beads. It had to have beads. 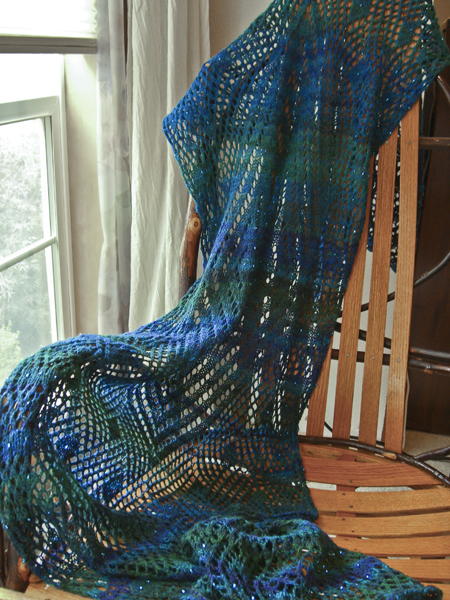 I found Stola Mit Arabesker Borte Und Mitte (Stole With Arabesque Edging and Middle), a free download on Ravelry. It didn’t have beads, but I thought I could add a few. The title was in German, and that gave me pause because I speak not a word of that language. But when I opened the pattern I was reassured. 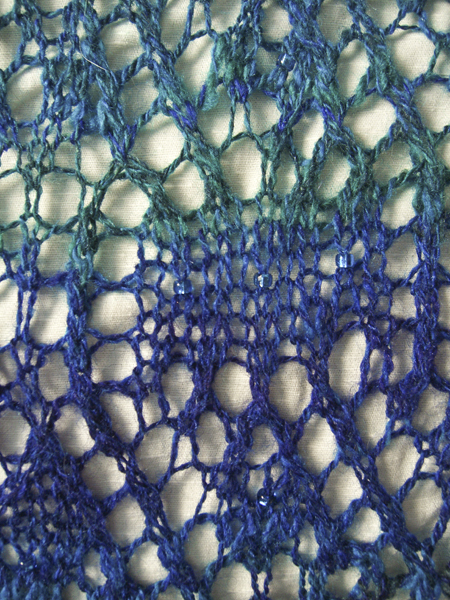 What few instructions there were – cast on, follow chart, bind off – are in English. It’s mostly just one big chart. I like charts! Then began a period of Sock Summit madness. And when I resurfaced and recovered from that, I though how fun it would be to knit that shawl and reveal it at OFFF in September. Duffy would be there, and lots of PDXKB and Spinnerati would be there, and tons of other people. And it would be so fun to show Duffy what I’d made. First I agonized over beads: sparkly teal with undertones of silver, or dark mysterious midnight with surprising flashes of sapphire. I polled on Twitter and Facebook, and I even knit a tiny swatch with both beads. Sparkly teal: hands-down winner. I started knitting. And then I started agonizing over whether I had enough yarn or not. I almost ripped it out and started something not-so-picky-about-length, like a faroese or something. But it was so pretty! I contemplated shaving a bit off the width and length so it was smaller. But the pattern has no repeats, so that would not have been all that easy. A Ravelry PM or two with the pattern author, and I began to hope that I would have just enough. I kept knitting and adding beads. I found that I could not take it anywhere – it was at-home knitting only. And I’d better not knit while I was feeling sleepy. It kicked my arse several times when I was sleepy and made stupid mistakes. Once I was sleepy and tried to fix a stupid mistake and ended up having to rip out 12 rows. Every time I was home, and awake, I knit obsessively. I really, really wanted to have it done by OFFF. And I started planning: if I can get two charts done today, two tomorrow, and one on Tuesday, I’ll make it. And I stuck to my schedule – mostly – and knit obsessively and finished the scheduled charts, and began to hope that OFFF would see the big reveal. I tried to keep it mostly very secret and not let Duffy know what I was doing, because I wanted it to be a surprise. And then I ran out of yarn. A foot from the end. Yarn. Gone. I wept. I cried and whined like a junky needing a fix I took a deep breath and bombarded Duffy with Tweets and emails wrote an email to Duffy. I see your nefarious plot, I said. Lure them in with the free stuff and get them hooked… I offered my firstborn male child to buy fiber if I could have more yarn. I even brought the sadly unfinished stole, still on the needles with a foot of knitting to go and 6″ of fiber remaining, to Wednesday Night Knitting, so everyone could see why it had to be finished and Duffy could see how much more yarn I needed. And everyone agreed that it was beautiful and need to be completed. 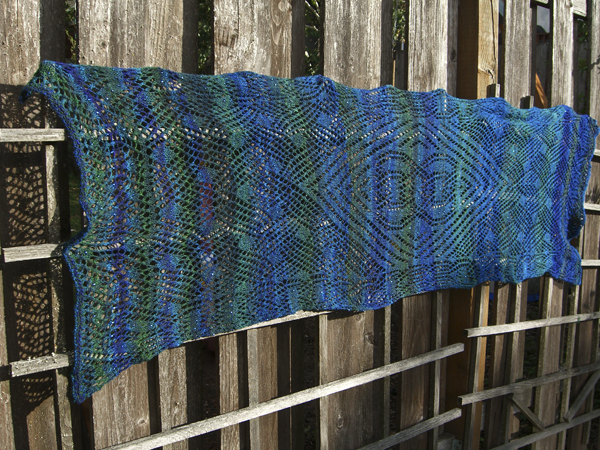 Duffy emailed Dicentra Designs to ask her to bring more Eowyn in the merino/silk blend to OFFF. And everything was set. What will you do if she doesn’t have any more? Someone asked. I wept again. And contemplated ripping the entire thing out and reknitting the same pattern with a different yarn for the border. And wept some more, then crossed my fingers and toes and knitting needles. At OFFF, Duffy and I duly proceeded to the Dicentra booth, where we found one – ONE – thingy of merino/silk in Eowyn. I held it tight. Is it enough? I asked Duffy? It’s plenty. I was vastly relieved and bought the Eowyn and two other thingys of fiber for Duffy besides. And I started breathing again. Back at the PDXKB/Spinnerati booth, I casually tossed the stole over one of the tables. Because it was pretty and I liked looking at it and petting it. And it was supposed to debut at OFFF anyway. I began to suspect that I was on to a good thing when people started coming from way across the fairgrounds. What is that? It’s so pretty! I saw the sparkles from way over there! I had a lot of fun talking about knitting with beads, and showing how I’d run out of yarn, but Duffy was, even as we spoke, spinning more so that I could finish it. I wish that the beads photographed better, but perhaps you can see them twinkling in a couple of the shots. It took Duffy hardly any time to spin the yarn and ply it and do all that stuff that has to be done to yarn when you’ve just made it. And one Wednesday night shortly after OFFF, Duffy presented me with a new skein of yarn. And I decided that I must immediately wind it into a ball so that I could start knitting as soon as I got home. And I pulled out my trusty nostepinne, and, swiftless, proceeded to turn the lovely skein of yarn into a tangled mess. There was a bit of friendly betting on Facebook as to whether I’d stay up until it was untangled or go to bed, and if I stayed up when exactly I would be finished. It was 3:30 AM, thank you very much. And yes I did go to work the next day. So I knit obsessively. And I finished it. And last Sunday I gave it a nice soak and then spread it out to block on #1 Son’s bed. It was so pretty! Monday night it came off the blocking wires. I settled it across my shoulders with quiet joy and gazed at it’s loveliness in the mirror. The colors were so beautiful and so me. And the beads – just the right number of them – twinkled like little stars as I moved. And I wore it Tuesday, and Wednesday, and Thursday, and Saturday. (Friday I took a break only because I didn’t leave the house that day.) 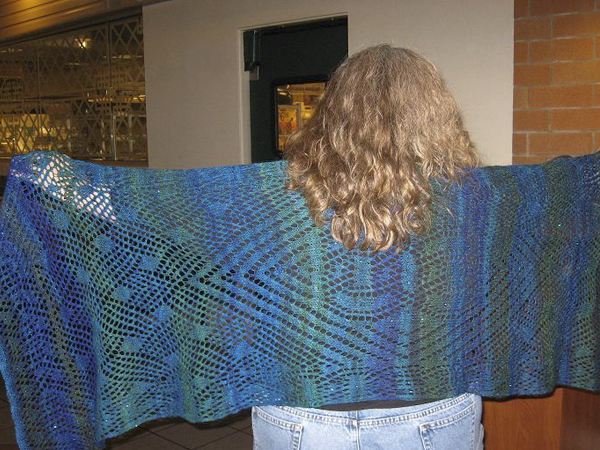 On Tuesday a colleague (a straight, male, non-knitting colleague) said, I’m sorry, I’m having a hard time concentrating on what you are saying because I’m captivated by your shawl. Oh, it was so beyond pretty! It’s by far my favorite knitting project ever. I love it beyond reason – even more than the Fair Isle poncho. It’s the perfect object. Duffy: thank you, my friend, for the gift of your fiber and your time to create amazing yarn that has become this wonderful, magical object. Thank you. I keep trying to take picture of it – some more successful than others. The darn beads just don’t show up like they do in real life. You will have to trust me that they are perfect. Today the weather relented and there was a bit of late-afternoon autumn sunshine on my fence. I was able to get one last glowing-in-the-sun shot. Ahhhhhh. It’s so pretty. Duffy will be bringing it to SOAR (because how could I refuse her request? ), so if you are going, too, track her down and ask for a peek. Yarn: Judy’s Magic spun by Duffy Stephens from silk/merino fiber dyed by Dicentra Designs in a colorway called Eowyn Ask Duffy if you want to know the spinning particulars. Modifications: Added beads. Nothing else. I am happy to engage in discussion with those who accept that technology and affluence are a net plus, but who worry about their troubling side effects. Spare me, however, the sensitive souls who deplore technological advance and economic growth over their cell phones on their way to the airport.